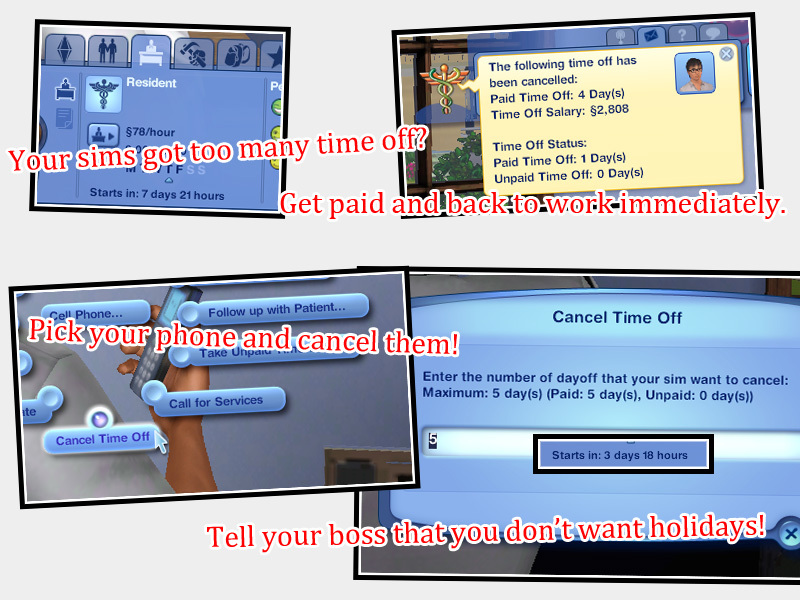 This is a script mod that adds a "Cancel Time Off" interaction to your sims' phone, if your sims get too many time off that take up most of his/her life, then you hate having holidays and want to cancel them. This always happen after your female sims have a several babies, you don't want too many maternity leaves that affect your sims' career! 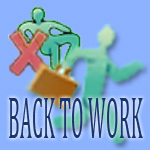 If your sims decided to cancel all (or some) of his/her time off, simply pick up the phone and call "Cancel Time Off", tell your boss that you don't want too much holidays, then they'll get paid and back to work soon. The option only appears if your sims got some days off, it's natural if the option didn't appear because your sims doesn't have any. 5/8/12: Thanks to Menaceman44 for reminding me that should be 'time off' instead of 'timeoff' and suggesting better English to use, and the input dialog is now showing the number of time off that your sims have. Also thanks to AnnaIME for Swedish translation. 15/5/12: Thanks amera86 for German translation. 23/5/12: Thanks tanoka for Spanish translation. 30/5/12: bug fixed: the interaction didn't show up. 10/6/12: Thanks yannickvanloon for Dutch translation. 22/6/12: Thanks Malobali for French translation. 23/7/12: Thanks ShimiChibi for Polish translation, Fixed wrong locale code. but there's no guarantee that there will be no problem, so take your own risk. No expansion pack is required to use this mod. I give support to English and Traditional Chinese, but please feel free to translate the mod into your own languages. I have the STBL strings uploaded here, if you would like to share your own translation, I would be happy to update the mod. Thanks to Peter and Inge Jones for S3PE. Thanks to all writers of general modding tutorials on MTS. CherryTS3_CancelTimeoff_Strings.7z | Description: Translation String. Not needed for normal use.